What’s the most popular item of clothing among travellers? Impossible to say for sure, but the hoody has got to up there. It’s so versatile, so handy everywhere from beaches to airports, but until recently it’s been a basic staple not considered tough enough for the outdoors. The Kahve tries to change all of that; all hail the thermal hoody. If you want to stay warm, wear figure-hugging clothes. It’s not what many travellers want to hear, but it’s true; the Kahve – reviewed here in its grey incarnation – skips a fleece lining, but does retain an anatomical cut that stays close. A combination of polyester and wool, the Kahve’s woollen lining is studded with tiny air pockets that trap-in warm air. 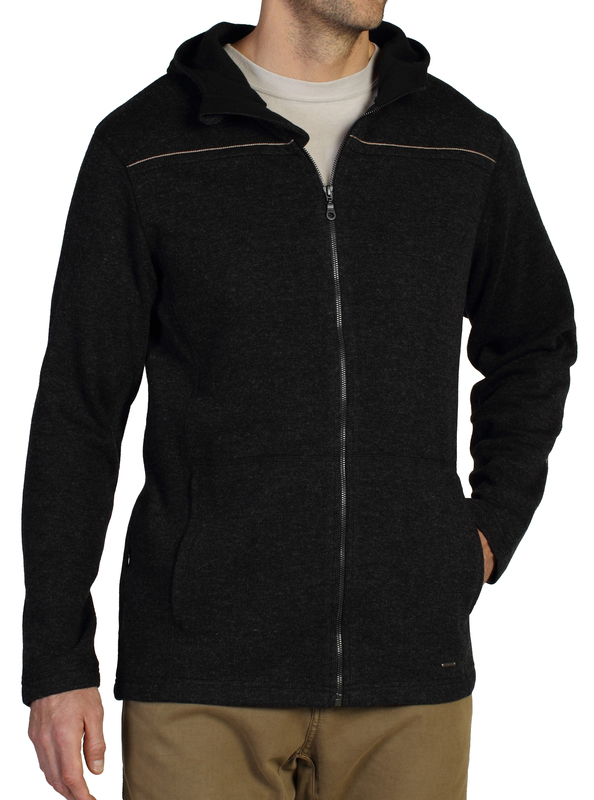 Where fleece does come into play is in the pockets, which can be zipped-up when not in use – that’s a nice travel touch. The only thin we’re not convinced about is the grid-style stitching detail on the back of the sleeves; it’s inoffensive, but serves no purpose. When it gets really cold, up goes the hood. In our wintry test, the Kahve’s hood not only stayed tight to our face, but the zip has a soft fleece-lined piece across the nose and mouth. That’s excellent design. When wrapped-up and stuffed into a sack, the Kahve weighs about half a kilo, which is about the same as most, though it takes up a lot less room than a standard fleece. Uncluttered by too many pockets, the Kahve fulfils its simple brief while looking smart and stylish. The zip works well and, most importantly, we stayed very warm. It’s a less serious travel-orientated product from ExOfficio than many items from its range, but it;s not less well-designed.